Some people in New Zealand have swimming pools and most own at least one car. But nearly everyone has a trampoline. Hyperbole? Why not. Yet walk down any street in Auckland and rest assured that if you suddenly get the urge to jump up and down, you won’t have to do it the old-fashioned way with your stupid old boring legs. Because there’s bound to be a trampoline nearby to assist you in meeting your leaping needs. 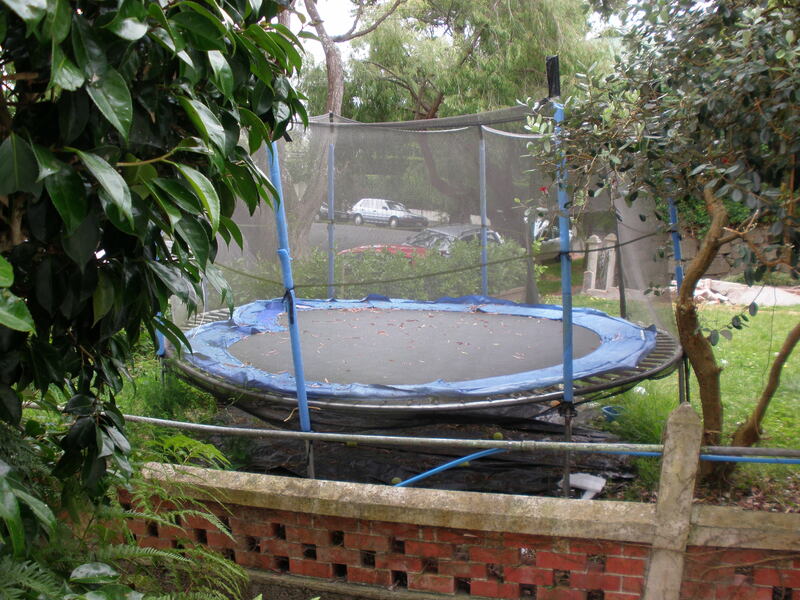 Indeed, there are at least three trampolines on my small block alone, including this one below. Not too shabby. But what does this fascination with assisted-leaping apparatuses tell us about the New Zealand psyche? Is it the first sign of a collective yielding to cabin fever? Or is it the crowning achievement of New Zealand’s national space program? Or is it just a funny coincidence? The trampoline-industrial-complex will have you believe that assisted leaping is fun, but they have yet to convince children of that fact. Maybe that’s because safety standards have improved since the dark ages of the 1980s when trampoline-related deaths seemed not so uncommon. Children just won’t do anything unless there’s a guarantee of somebody getting hurt. That’s why despite the prevalence of such contraptions throughout Auckland you will never under any circumstance see a child have fun anywhere near a trampoline. To get a picture of what we’re dealing with here, check out this map (view The Trampolines of Auckland, NZ in a larger map) I made showing all the trampolines in a 1.6 square kilometer area of Mount Eden. Note that though it is a sunny day and many of the trampolines are perfectly visible, there isn’t one child jumping up and down with assistance. Trampolines can never be overrated! I now will add your New Zealand locations to my data. ‘Assisted jumping’ (I roared, now approaching the ‘assisted’ anything age) can be enjoyable and actually get the jumper in a ‘zone’ so to speak. The uterine effect also is quite interesting..ask any woman. A wonderful sunset shot Simon! Send more. I so enjoy reading your blog and am laughing aloud and feeling like quite the traveler. Thanks for the kind words, Charlotte. I’ll have to ask Jacquie about this uterine thing. Trampolines: something for everyone. What’s the etiquette on sipping a fine yellow tail chardonnay whilst trampolining? Ha! Yellow Tail is the recommended label for trampolines. Now don’t you all go making fun of my favorite beverage. There is a Yellowtail for every occasion – including trampoline jumping, senior division. Perhaps that’s why there are no children on those trampolines. They are all owned by the over 50 crowd who have been waiting for New Zealand to lift the ban on Australian wines so that they can properly enjoy and employ their trampolines. Mormon’s are also big trampoline enthusiasts. Is there a large mormon pobulation in NZ? I think you have to be a Mormon here to purchase one. Truthfully, I’ve heard it is a growing religions here. I am not sure if you are aware of this Simon, but your Mother is quite skilled at tandem trampolining. We are required to wear special outfits made from rainbow colored parachute fabric. Because of the tumbling that is also included in this event, we must imbibe our chardonnay through sippy cups. Your Mom always wins this competition; I just go along for the exercise and inevitable concussion. I can definitely believe that. Especially the chardonnay in a sippy cup.